I have a GoogleSheets spreadsheet that logs major story events as well as milestones in each of my character's histories... it's not only helped me set things straight in my head, and helped me settle my characters in the world better, but also useful when building history with other's characters. Saga Étoile (born Symia Mek on Zhellday 3, Month 5, 4 BTC), is human singer and actress from Corellia, in the . After appearing in commercials and holo-dramas such as ‘The Coruscant Files’ and ‘The Young and the Forceless’, Mek launched into a singing career with Gold Dome Records, skyrocketing to the top of the charts with her sweet holo-vid for her jazz debut single ‘If The Stars Were Mine’, from the album ‘With Love. S. Étoile’. Her career soon took off with appearances at reputable cantinas and even making appearances at the personal functions of several high profile Senators and Military officials. 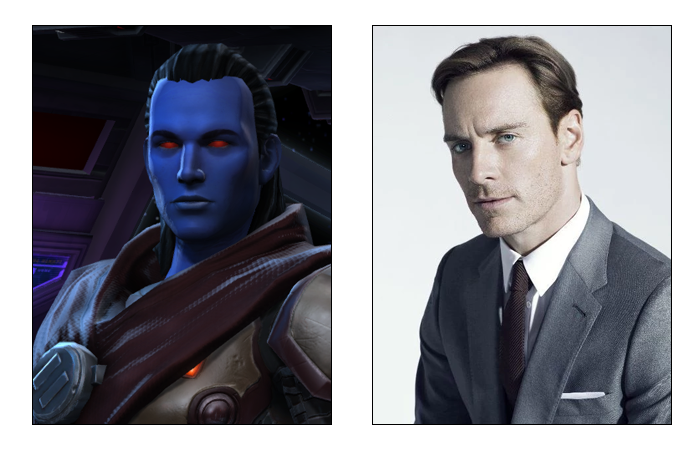 The star was born on Corellia, to Jarren Mek (a lower executive of Cisori-Mek Industries) and his wife, Patricia Llyod-Mek. Symia lived a life of decent privilege as a child, but when her parents were killed in a speeder accident, the star reports her grief was so deep, she needed a fresh start. She gave up her inheritance and moved in with her aunt on Coruscant and began to pursue her passion for music. [16 ATC]: The Young and the Forceless. For half a cycle, Saga appeared in a semi-frequent role on a popular holovid series that was about a group of friends and once turned out to be Force-sensitive and had to become a Jedi. 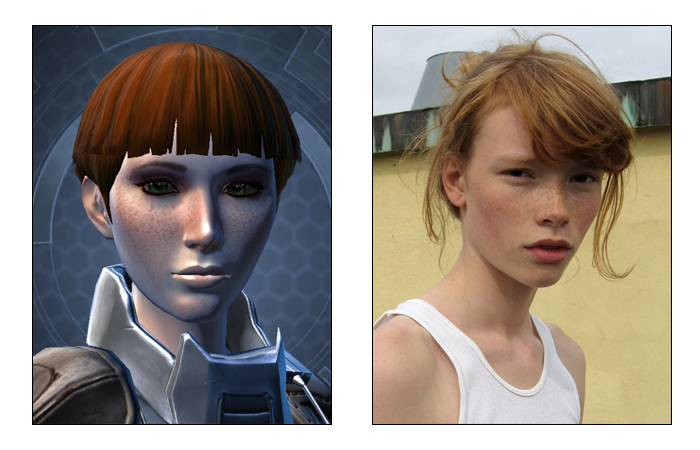 Saga played the role of Elody Meyer, the daughter of a Senator who was in love with Casen Jin, the Jedi. 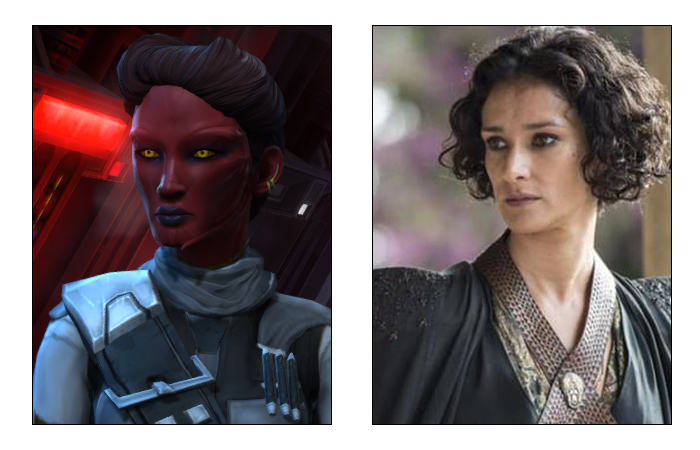 Her character became a fan-favourite, and many were upset when the writers killed Elody off at the hands of Darth Rexor (played by Kailo Darren) in the Sith’s ill-written revenge plot. [16 ATC]: The Coruscant Files. 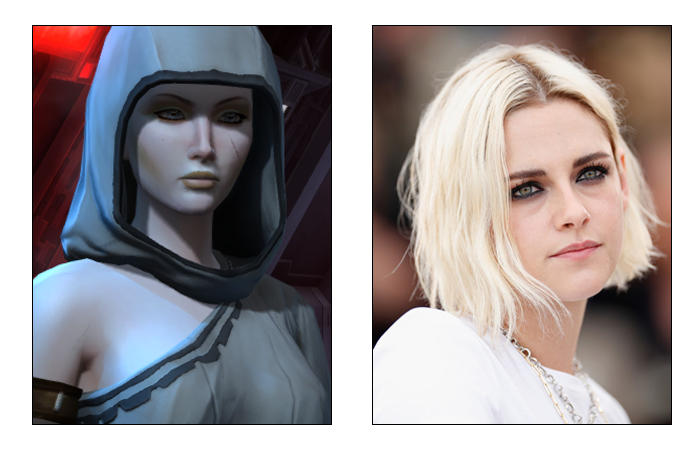 After her first acting success, and the fan-rage at her character’s death, C-Entertainment offered her a role on another one of their projects -- The Coruscant Files. Playing the part of Jaeda Marrow, a dry-witted Corellian secretary of PI-007, a surly and logical detective droid. It was during her short time on this noir-drama that the star first revealed her singing prowess to the public. 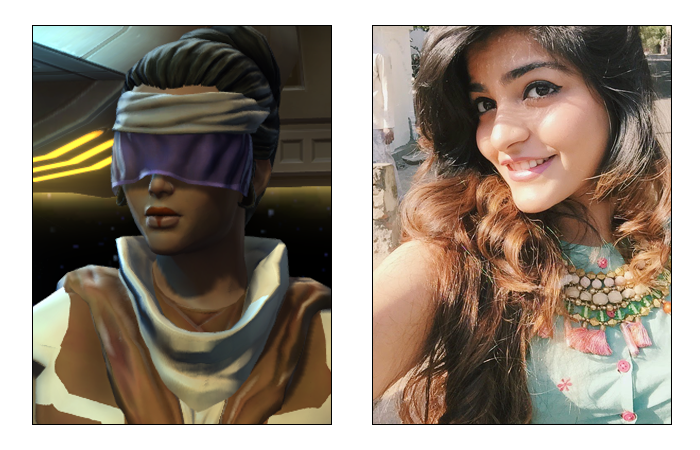 To help PI on a case, Jaeda went undercover as a cantina singer, delivering a soft and sultry performance of ‘Fever’. Though her role on the show only lasted a season and a new companion for PI was introduced, this marked the very beginning of her music career. As seen through her collection of songs, Saga is a woman who wears her heart on her sleeve. After her rush to fame in 17 ATC, it wasn’t long before she was meeting and greeting with some of the Galactic’s upper echelon at public events and fundraisers. Later that year, at the Galaxy Music Awards (where the star won ‘Most Inspiring Artist’), she was spotted with Aris Maar, the eldest son of Senator Huxley Maar of Selonia. The pair reportedly dated for almost a cycle before the love affair ended abruptly. Reports claim Saga was infatuated with another, and poor Aris ended things before returning to Selonia. Throughout 18 ATC, Saga avoided discussion of her private life in the media, however the tone of her music lead fans to speculate that the object of her new affection was likely a lucky soldier in the Republic Army, from the lovesick tone of her second album, Stand Strong, Galactic Heart, which featured many songs alluding to the War with the Eternal Empire. It came to light by way of some holos taken at several Military dress affairs and a fundraiser for the troops, that the man in question was supposedly Admiral Markus Lao, a Republic officer and a married man. At the beginning of 19 ATC, the public’s speculation on the star’s love life was blown wide open. Reports and photographs of Saga sporting bruises and minor cuts to her face when escorted to a Coruscant hospital spurred rumors that this love affair had taken a dangerous turn for the star. Rumors of Lao’s violence, and the star’s stim-abuse and following suicide attempt littered tabloids for months. Eventually, under the heat of heavy press, the star admitted in a tell-all exclusive with ‘C-News’ that the affair was a silly infatuation that she regretted, but felt powerless to get out of. The Admiral was investigated and ultimately removed from rank, but the star claimed that staying in Coruscant was too painful, and she needed to take a step back from her career while she recovered. 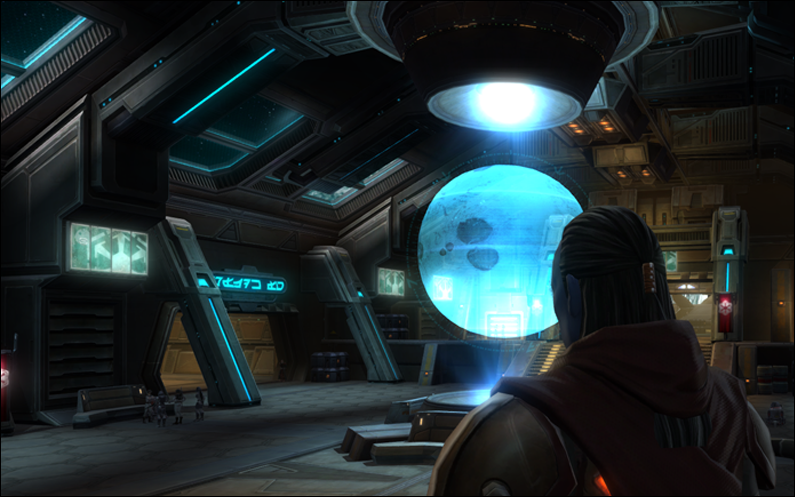 A Holo-log popped up on the Net, detailing the star’s personal struggle with recovery, reportedly from Naa Shaddaa. She released a few new songs during this year via her online channel that obviously drew from the dark place she had fallen into. Fans continued to support her from afar. You can find the regular holo-logs of Saga Étoile, here. 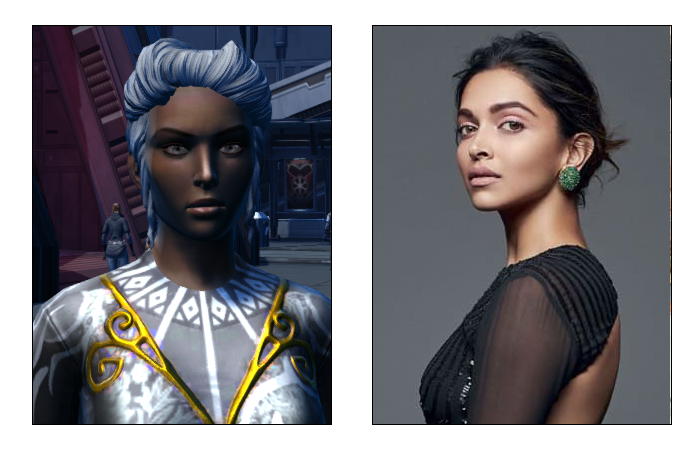 While she tend to frequent the cantina scene of Naa Shaddaa, in recent months the fallen star has become silent, reportedly working on a ‘secret project’ she hopes to reveal to her fan soon. The number holomag in the outer-rim, and the one-stop spot for your celebrity fix. Growing up, there had always been two ways most people dealt with Briella; willful ignorance that she event existed in the same space as them, or going out of their way to make a point of her ‘subpar breeding’. Half-miraluka was the known fact. The charity adoptive of Admiral Dorn and his wife -- and much to the chagrin of this half-Miraluka, Kamina Brennan was one of the latter. Tall and pale, with an Imperial pedigree to boast about -- which she did. Frequently. The grand-daughter of Moff Huxley Brennan, a well-known Kaasian socialite and now, Kamina could add recently-appointed ‘Prefect at Veleshtikov’s School for the Elite’ to her list of achievements. Briella frowned and turned her attention to her locker. As the steel door creaked open, Kamina’s keenly manicured hand firmly set it shut again. The older girl smiled down on her sweetly. The threat was cut short by the clearing of a throat. ‘For the love of the Empire...’ she praised silently. Briella had nearly reached her daily cap of tolerance for public humiliation. She glanced over her shoulder, to the stairwell where the sound had come from. Fælan Rigante stood, stiff as a board -- or a pristine sculpture, depending on who you asked -- looking in their direction. As she backed away from the lockers, Kamina gave Bri a look that promised she would certainly follow up when less important eyes were on her. Smoothing her hands down the length of her platinum braid, she gave the Echani a demure smile and ran off in his direction. Fælan had always caught her attention. Not in the way he caught Kamina’s, or even because she was secretly a little jealous the Echani boy never seemed to receive much Imperial ire for his heritage -- despite being technically more alien than she was. It was the Force that caught her attention. The only connection she had to her mother was the way she saw the people and the world around her -- the way the Force touched and connected everything, and it had always moved strangely around Fælan. The Echani was a calm, radiating web of bright and deep blues. Occasionally a stray spark of fiery orange or red streaked through his being, as proof that behind the steely, pristine exterior was more. It would have been beautiful, if it weren’t for the strange sliver of void at the center of it all. It made him seem lonely. Incomplete. Part of something bigger that she couldn’t see. Briella watched the pair walk off and sighed. Maybe Faelan’s attention would divert Kamina for long enough for the half-Miraluka to get through the rest of the day without another round of bullying. Turning, she opened her locker and frowned. Upon the top shelf, a data-chit sat. Its sleek chassis was engraved with the triangular calling card of a Veleshtikov urban legend -- the Oculis Imperatoris. As the halls began to empty, Briella fumbled around for her earbuds, connecting them to the device and pressing play. A voice, modulated to obscure the sender spoke. Truth be told, Briella had already awoken. The tiny child sat nestled against the door ajar to the sitting room, having crept her way down from her room at the sound raised voices. Her dark cheek carefully pressed to the silver rim of the door frame as she silently observed her parents fighting. Father’s work kept him starbound, often living more on his starship than at their opulent Kaas City apartments, and usually his homecoming was a cause for celebration. It put Mother at ease -- something rather rare to come by. This night, was different, and Sabriella knew it was her fault. Her Mother’s words were a dangerous hiss, barely an attempt to lower her volume. Sabriella would have known their meaning even if she was deaf. From the open crack in the door, her opalescent eyes took in the scene beyond with the help of the Force -- a gift and a curse, granted from the woman who gave birth to her. Sabriella wilted against the door frame, listening to her mother break down into furious tears. She squeezed her eyes shut, burying her head into her knees, trying to block out the sight. But it didn’t work that way. Just as the Force was ever-present, so was Sabriella’s vision. Her Mother’s embarrassment and anger. Her Father’s guilt. She didn’t understand why exactly… but she saw it clearly, and knew it was because of her. Her Father sounded worn out as he sighed heavily and relinquished his glass of whisky. She couldn’t bear to listen anymore. A swell of tears threatened to run down her cheeks as the half-miraluka got to her feet and went to dart back to her room and hide beneath the covers of her bed like this was just a bad dream. When she cleared the hall, she found her older sister awake, sitting upright and glaring at her with a deep, red disappointment. Sabriella hung her head, creeping into the covers and buried herself in deep. Two paths begin to merge. Soon. Tas’ra had been aware of the presence for weeks, now. Awoken by visions of Belsavis calling out to deliver a prize, his mind had been set to depart for the chaos of the outer rim the very moment he saw the lead pass through the Shadow Banda’s system. Somewhere beneath the tropical chasms of humidity, within the entombed earth beholden to the Rakata, he knew it waited for him. The commotion of the orbital station was barely noticable above the ominous hum of the Force. Here, the strange ripple seemed… louder. The feeling drew Tas’ra’s attention away from the bustling port staff and general chatter, like a siren song -- taunting him with it’s illusive tug. The nasal simpering of some Imperial clerk interrupted, and the Chiss returned in kind with the raise of a single hand. Inwardly, Tas’ra felt the swell of amusement, as the young man flinched -- showing a tick in his programming that was telling of the other Sith he’d encountered. But the hand was simply a hand, urging the Imperial to cease his grating apologies. The raised hand gestured to the security station beyond. Glad for the dismissal, the intact Private hurried off, leaving the Sith to his thoughts. His crew stood at the ready, long since finished with the gear checks and manifests, but they all knew better than to interrupt his focus. Another security officer was dealing with another group of interested parties, though the group seemed to be encountering resistance. He held his hand up, shaking his head as dark-haired Human held up a datapad. “There must be something wrong with your scanner, try again. My pass was fine last month!” the Human man insisted, offering his documentation again. A group of aliens gathered nearby, as roughly put together as the Human was. Mercenaries, most likely. Tas’ra watched with a narrowed gaze. Looters looking for a payout if they could pick the bones of Belsavis clean, no doubt. A young Trandosian towered behind the Human and on a bench nearby, a Twi’lek woman whispered nervously to a Mirialan. Curiously, the Human went back to the group, seemingly reporting to the Mirialan. The Chiss let his boredom dictate his curiosity and focused in on the conversation. “Don’t worry, Jekka… it’ll be fine!” the Mirialan whispered. Tas’ra had almost lost interest when he noticed something unexpected. The Force moved, ever so slightly, around the Mirialan as he leaned in close to the security officer flashing a charming grin and whispering something quietly. With a subtle gesture of his fingers, a small ripple of persuasion washed over the Imperial, who loosened his grip on the rifle in hand and hazily smiled back. Tas’ra narrowed his eyes on the verdant-skinned man, curiously. Pulling the Mirialan’s attention from the object of his persuasion, the Chiss watched the flirtatious smile drain from the young man’s face with interest. Tas’ra could feel the tangible spike of fear resonating from him as he rushed back to his crew. The Sith's lips curved into a smirk. Thanks to @Auryn for the introductory RP to my little new apprentice that has joined the Valefor. It was the most fluid, enjoyable improv I've done in game so far and am very excited to see where this goes! "My 'bad side'? Darling, all I have a good sides..."
"There are many ways to serve the Empire. Mine just includes expensive jewels and top-shelf liquor." The woman of many faces. "The prudent learn, but it is the bold who are enlightened..."
"No one notices the skinny redhead. Well, okay... so they notice, they just don't care." Friend of droids, and Intelligence Cadet. "Don't forget your registered safe word, sugar. It can get a little wild here after dark..."
Sith Overseer with some creative uses for Force Alchemy on her off-time. "I fight... because it is the most natural thing in existence." Proud Echani, newly-claimed apprentice to Lord Baeflir Yosoth. "Okay, old man. Show me how it's done..."
Congrats to everyone who won, I thought all your costumes were great! It was great turnout, and it was a blast! I had a lot of fun greeting and tending bar for you all on my awkward little Selaan in her unfortunate uniform. And a special shoutout to whoever plays Ash'ette -- thanks for hanging out and chatting with my lil' awkward redhead. She very appreciated a cute Twi'lek taking time to be chill with her! Thanks to @Auryn for hosting the masquerade... was a great near-twelve-hours of RP! And thanks to everyone who attended over the course of the day/evening. I am thoroughly exhausted and happy about all the fun that was had. I've been pretty focused on establishing The Dark Chorus and our hopeful future Imp Night that is being discussed... but I do love Rishi and have been looking for a good excuse RP my new indie character, so I would love to come check it out. But I'm on Australian time, which generally means like... 10pm server time, I start getting stuck into the game on weekdays. I often jump on around 5-7pm server time too, though. So it's not something I can say with certainty I can make on a weekly basis. More than happy to do a shoutout on ImpOOC if I'm looking to head out there though!